Dr. Genevieve Summerford prides herself on her ability as a psychiatrist to understand the inner workings of the human mind. But when one of her patients is arrested for murder-a murder Genevieve fears she may have unwittingly provoked-she begins to doubt her training and intuition. Unable to believe that her patient could have committed the gruesome crime, Genevieve seeks out answers, desperate to clear the woman's name-and her own. Over the course of her investigation, Genevieve uncovers a dark secret-one that could, should Genevieve choose to reveal it, bring down catastrophe on those she cares most about. But, should she let it lie, it will almost certainly send her patient to the electric chair. 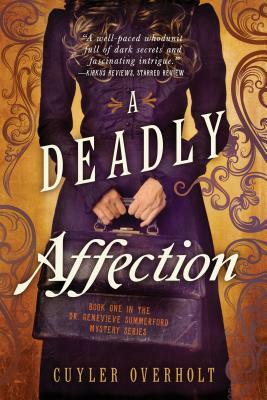 Steeped in the gritty atmosphere of turn-of-the-century New York City, A Deadly Affection is a riveting debut mystery and the first in an exciting new series featuring Dr. Genevieve Summerford.